PSTET Punjab State Teacher Eligibility Test - SCERT PSTET Notification released check here official dates, fees, eligibility criteria for entrance exam. SCERT , Pmjab invites applications for PSTET-I & psrET-tr 2017 to be conducted on 3l-12-2017 (Sunday) for those nrho want to be eligible for rypointncnt as a teach€r for classes I to v and vI to VIII. Eligible candidates can ryply online only on . Graduation with 50% marks and 01 year B.Ed. Senior Secondary with 50% and 04 years B.El.Ed. Senior Secondary with 50% and 04 years BA/B.Sc. Ed. or B.A. Ed. or B.Sc. Ed. 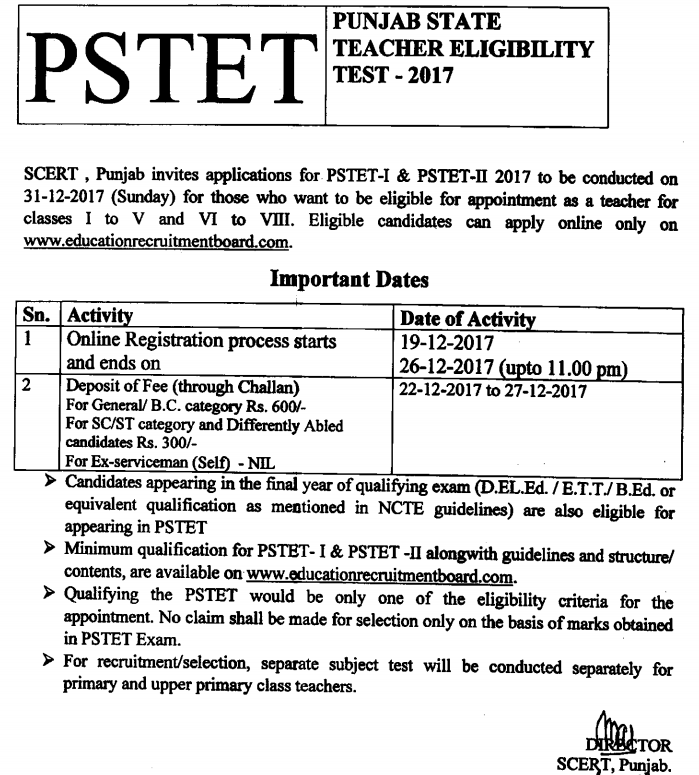 How to Apply for PSTET – Interested candidates can apply online through the official website of PSTET 19-Dec-2017 to 26-Dec-2017.